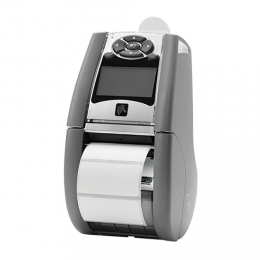 The mobile label printer QLn220 Healthcare from Zebra repels it all its special plastic housing withstands daily cleanings, even with harsh disinfectants such as alcohol, hydrogen peroxide or chlorine-based bleach. Thus, the QLn220 Healthcare effectively reduces the spread of germs in hospitals, etc.Features:Cleanser-resistant mobile label printer for the healthcare sectorConnection via RS232 and USB, optionally with Wi-Fi and BluetoothMax. print speed 102 mm/sec. The mobile label printer QLn220 Healthcare from Zebra repels it all its special plastic housing withstands daily cleanings, even with harsh disinfectants such as alcohol, hydrogen peroxide or chlorine-based bleach. Thus, the QLn220 Healthcare effectively reduces the spread of germs in hospitals, etc. Thanks to its compact form the QLn220 Healthcare is ideal for on-site printing of patient labels for samples and records. The instant print results prevent healthcare employees from making any mix-ups later on, thus also avoiding any resulting complications. Equipped with RS232 and USB interfaces, as well as optional 802.11 a/b/g/n dual-band Wi-Fi, Bluetooth 3.0 and NFC, you easily connect the QLn220 Healthcare. Using the cradle you also perform maintenance and updates using the Ethernet network connection. The Zebra software environment Link-OS additionally simplifies daily remote maintenance. Another bonus the QLn220 Healthcare is completely compatible with existing QLn printers and their corresponding accessories, so when you make changes only the printer must be purchased new.